Here’s another Southern Sunday by Author Alle Wells and once again she is enchanting us with her glimpses into Southern living. I especially got a kick out of her reference to Tomato Sandwiches – because when I was a child we’d visit an aunt who lived on a farm and my favorite thing was to take a loaf of bread and a salt shaker and head for the tomato patch – wash them, nah. Just salt and eat! Enjoy Alle’s story…I know I did. Here in the South, a good tomato sandwich and summertime go hand in hand. I can’t count the number of times I’ve heard someone say, “I love a good tomato sandwich!” Everyone around here knows that a good tomato sandwich is made with a good, home-grown tomato, not the kind that you buy in a grocery store. Biting into that summertime freshness makes you want to savor it for the cold winter months ahead. I haven’t solved the mystery of preserving the texture of a fresh, whole tomato. But I continue to search for ways to preserve their luscious flavor. I’ve heard that there are 10,000 varieties of tomatoes and over 600 kinds of Heirloom tomatoes. Personal preference rules the day when it comes to choosing the perfect tomato. Personal favorites vary from region to region and family to family. Most of us prefer the kind of tomato that Mama put on that good tomato sandwich when we were kids. If you grew up near the Appalachians, the curly-topped German Johnson may be your first love. If your roots are Italian, the sensuous aroma of simmering sauces made from plump Romas may bring you to your knees. I grew up on great big, juicy Beefsteaks grown in the fine, sandy soil of eastern North Carolina. People either love tomatoes or they hate them. And the people who love them want to grow them. When our garden tomatoes multiply beyond the recommended daily allowance of tomato sandwiches, we look for ways to preserve those seasonal beauties. Emily, my character in Lame Excuses, cans tomatoes in a water bath. 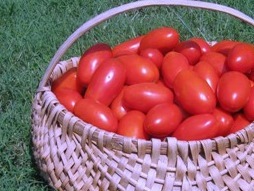 The water bath process is the accepted method of preserving tomatoes in the South. She makes chow-chow with green tomatoes and uses red tomatoes for succotash. Emily is young, industrious, and a culinary expert. I possess none of those characteristics and try to avoid canning. In my quest for an alternative to canning tomatoes, I’ve discovered dehydrating. As I mentioned in an earlier post entitled Holy Organic, the instructions for drying tomatoes range from 15 hours to 2 or 3 days. Since then, I’ve spent the summer cultivating the perfect dried tomato. I start with a firm Heirloom tomato. The process includes blanching until the skin falls away, dipping into an ice bath, slicing to three-quarters of an inch, and dehydrating for ten hours. 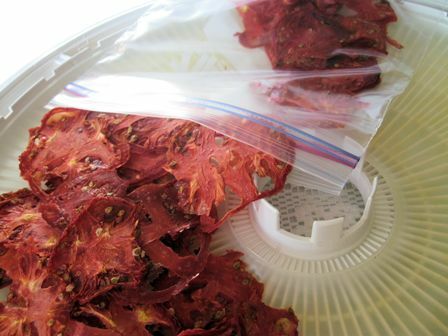 Dried tomatoes have a leathery texture and retain that good old summertime flavor. They can be frozen and rehydrated to use in your favorite recipes or sealed in a jar with olive oil and a leaf of basil. 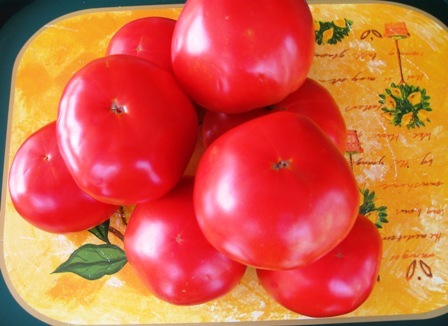 Do you have tomato stories that you’d like to share? I’d love to hear from you. Please join me next week, when I’ll talk about methods of drying apples in Savoring Summer Fruits. In the meantime, have a good tomato sandwich before they’re all gone!